Yet another dish that takes me back to my childhood. This soup is the epitome of Vietnamese comfort food. 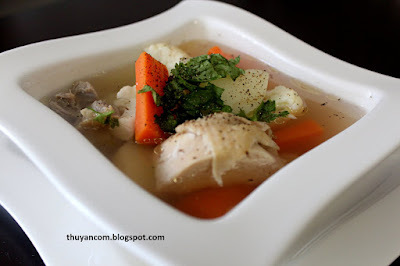 The broth is simple and clean, flavor by the sweetness of the vegetables and bones. I love eating this soup when I'm feeling under the weather, it make you feel like everything is going to be alright. This soup is quite versatile because you have a lot of choices for ingredients. For the meat you can use chicken, pork, or beef. I prefer using pork neck bones but I had some left over chicken from another dish. You can also use ground beef or pork instead of bones. Choices of vegetables can also varies depending on your taste or whatever you have available at home. My mom usually makes it with potatoes, carrots, and sometimes beets. Beets has to be my favorite, it's incredibly sweet, but unfortunate beets are not on my weekly grocery list. For this recipe I used carrots, red potatoes, and cauliflower. Play around with the ingredients, you really can't go wrong with this recipe. Enjoy! 1. Rinse your chicken and remove some of the fat if needed. 2. Place the chicken in a pot, add about 5 quart of water an half the onion. Add half a tablespoon of salt and let the pot come to a boil. Remove the excess scum from the pot. Once the scum has been removed, turn down the heat to medium heat until chicken get cooked. 3. Wash the vegetables and cut them into desired size. I like my vegetables pretty chunky so it doesn't overcook as easily. 4. Throw in a quarter size chunk of rock sugar and a couple teaspoon of mushroom seasoning to he broth. 5. Once the chicken is done, remove from pot and let it cool enough to handle. 6. Taste the broth with 2 tablespoon of fish sauce and a couple dash of black pepper. 7. After tasting he broth throw in the carrots first and then potatoes. The vegetables should be soft enough to eat but should still have texture. Throw in the cauliflower at the very end. 8. Last minute tasting with more sugar and fish sauce if needed. 9. Serve with chopped cilantro and more black pepper. my grandma used to make me this when i was young and was a picky eater. She also add white beans to it to make it heartier. I love your blog and recipes. thuyy where have you been? looking forward to your next post! Thanks for share the amazing descriptive article about restaurant in charleston and receipes they serve. Find your local King street restaurant for vietnamese receipes where you can have banh mi, pho, cocktail, noodles in your launch or dinner.